A half hour east of Portland can be found the Columbia river Gorge, Multnomah falls and some of the most magnificent scenery in the country; skyscraper cliffs, giant sturgeon, and majestic waterfalls. During the last ice age, a cataclysmic event occurred, that left a lasting monument along the path of the mighty Columbia River. A great flood sheared away the land, leaving stone cliffs and water falls that form the world famous “Columbia River Gorge”. 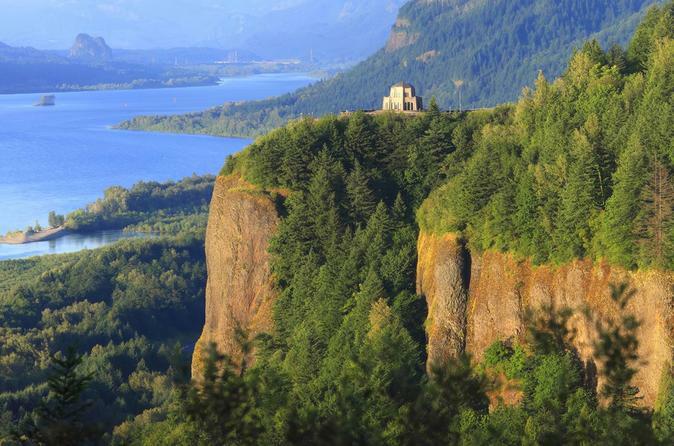 View the majesty from the Vista House atop 800 foot sheer rock cliffs, see Multnomah Falls, the second tallest year round waterfall in the country, or witness the free-falling splendor of Latourell Falls. In the autumn, witness salmon spawning in nearby Eagle Creek. First we head east in a small private van,on highway 84 to Bonneville dam and view the fish ladder and hatchery where you'll find Herman the ten foot sturgeon. After saying hi to Herman, we’ll head back toward Portland along the historic Columbia River highway, but not before seeing some majestic waterfalls. The first waterfall is Horsetail Falls, and then Multnomah Falls, the highest continuously flowing waterfall in the country! You'll also have an opportunity to do a small hike to the Simon Benson Bridge. Continuing on we stop at Shepherds Dell Falls, Bridal Veil Falls and the magnificent Latourell falls, where we'll do another small hike. From there we proceed to Crown Point vista house with a spectacular view of the Columbia River Gorge before heading back to Portland. Price includes all transportation, pick up and drop off (within a five mile radius of downtown Portland) and bottled water.